We, the League of Filipino Students at San Francisco State University, are in support of the partnership of San Francisco State’s Memorandum of Understanding (MOU) with Al-Najah University in Palestine, the AMED program (Arab Muslim Ethnicities and Diasporas), and their advisor, Dr. Rabab Abdulhadi. These partnerships and programs are vital to building long-term relationships between students at SFSU and the Palestinian, Arab, Muslim, Christian, and Jewish communities at Al-Najah. Programs and majors such as Ethnic Studies and Race and Resistance Studies are important to understand our people’s history. The repression of the civil rights movement in the 60s are not isolated incidents from the repression that students are currently facing on our campus at San Francisco State University. It is carried on through the increased policing and harassment of students’ democratic rights and through policies that allow xenophobic and racist speech and actions on campus. The people are crying out for the need for relevant, pro-people education. End the repression of students’ democratic rights on campuses! General Union of Palestine Students – SFSU’s Statement of Support for SF State’s MOU with Al-Najah University in Palestine, the AMED program, and Dr. Rabab Abdulhadi here. Mula Sa Ugat, the alliance of Filipino organizations at San Francisco State University condemns the state-sanctioned murder of black lives, most recently Philando Castile, 32, of Falcon Heights, Minnesota and Alton Sterling, 37, of Baton Rouge, Louisiana. We extend our deepest condolences to both men’s families and mourn alongside the black community. On July 5, Sterling was selling CDs in front of a convenience store until an anonymous caller tipped the Baton Rouge police off and alleged that Sterling was threatening them with a gun. Two police officers tackled Sterling, who was not resisting, and fatally shot him. On July 6, Castile was pulled over due to a broken tail light but the police shot him in his car as he was reaching for his driver’s license and registration. Castile’s girlfriend and her four-year-old daughter were in the vehicle when they opened fire with no regard for the child’s safety. These are not isolated incidents: As of July 7, 116 Black Americans have been killed by the police in 2016 alone. It is vividly clear that racial discrimination against Black Americans have persisted through the civil rights movement. Structural racism issues left unattended allowed the police officers to act as judge, jury, and executioner in the cases of Alton Sterling and Philando Castile. The U.S. was built on the backs of Black Americans’ unpaid and stolen labor. Historically the main intent of the U.S. government and law enforcement was never meant to protect and serve black people in the United States. The oppression and killings of Black Americans have persisted since the inception of the U.S., and yet it seems that only now that the veil of ignorance on this structural violence is being pulled back centimeter by centimeter. We must remember that anti-black racism is the crux of racism against other people of color. We cannot achieve justice and liberation without uniting with black people. As Filipino Americans, we recognize how our struggle is connected with theirs with our roots stemming from solidarity during the civil rights movement. Even during the Filipino-American War of 1899, it was recognized how African Americans from the Buffalo Soldiers defected from the U.S. to unite with the Filipino people in their struggle against American colonizers. The Black Lives Matter movement exists because black people continue to be the most oppressed in American society and face the most severe social and economic difficulties. The BLM movement and we, as Filipinos, should act with and under the leadership of black people. It is our responsibility for us as Filipino youth is to educate ourselves on BLM and understand the anti-blackness that is within our community in order to understand the discrimination we all face as people of color. A mass movement, that serves the interests of the people should be first and foremost people-oriented. It must aim to unite and create a collective culture where we love each other and support each other. We express our deepest sympathies to the affected families of Alton Sterling, Philando Castile, and all other victims of state violence and structural inequality. We stand firmly with black lives. Alton Sterling – Philando Castile – their names must be said until it is heard. Beyond their names are the lives they lived before they were stripped away. END STATE VIOLENCE! END POLICE TERROR! COMBAT INEQUALITY! CHANGE THE JUSTICE SYSTEM TO TRULY SERVE THE PEOPLE! The League of Filipino Students at San Francisco State University vehemently condemns the events that transpired at Pulse nightclub in Orlando, Florida. The mass shooting took place at Pulse, a gay dance club in Orlando, Florida. Members of the LGBTQ (Lesbian, Gay, Bisexual, Transexual, Queer) community were targeted and reports say that 49 lives were lost and 53 are injured. Mula Sa Ugat, an alliance of Filipino organizations at SFSU, extend our love and support to the families of the victims in the wake of this tragedy. LFS-SFSU denounces the biased attitudes of the mainstream media which fails to address the underlying issues that the U.S. has failed to take action; the longstanding presence of homophobia in the U.S. and the policies that continue to discriminate against the LGBTQ community at a state and nationwide level. The true root of the issue lies in the larger system of U.S. Imperialism that uses fascist tactics to divide its people by the use of patriarchy, islamophobia, and homophobia. The ruling class of U.S. Imperialists, or the 1%, uses the media as a tool to create disorientation to rupture trust within communities. We call on members of the community to gather together and actively engage in conversations that actively supports the struggle of our LGBTQ and Muslim communities, remaining vigilant against acts of discrimination, and prioritize building genuine international solidarity among all oppressed peoples. The names of those killed in the shootings can be found here. Rice Not Bullets! Justice for the Kidapawan Massacre Victims! We, the League of Filipino Students at San Francisco State University (LFS-SFSU), condemn the Philippine government for the violent massacre of protesting farmers in Kidapawan, North Cotabato, Mindanao. With El Niño in effect, a drought has gripped the province since November, 2015. Officially, the region had been in a state of Calamity since January. The protesters were demanding immediate government relief which was not given, thus leading to barricades at the Cotabato-Davao Highway. The morning of April 1, 2016 (GMT+8) a state of “Maximum Tolerance” was decidedly reached by the side of the Philippine National Police. As such, the group of 5,000 farmers were met with a rain of bullets coming from none other than the PNP (Philippine National Police). In the process, 5 farmers were confirmed dead, about 116 are wounded and 89 were reported missing. The government had refused rice subsidies to farmers hit hardest by the El Niño. Afterwards, rather than address the needs of the people, the PNP chose to threaten sanctuary in order to further violently suppress the protestors. If the question must be asked: “Who does the Philippine Government serve?” Their violence is a clear answer. In the midst of all of this, we demand that justice for the farmers murdered by the state is found. Justice for the farmers of Cotabato! Protect the livelihood of farmers and workers! Justice for the victims of state violence! Justice for the victims of the BS Aquino regime! Rice, not bullets! Bigas, hindi Bala! Youth and Students at San Francisco State show solidarity with Kidapawan. We condemn SFSU President Leslie Wong and Provost Sue Rosser for financially neglecting the only College of Ethnic Studies in the U.S. The college faces a proposed 40% budget cut that would lead to more impacted classes, the laying off of staff and faculty, and the dismantling of important resources such as the Ethnic Studies Student Resource and Empowerment Center and the Cesar Chavez Institute Student Research Center. On February 25, students and faculty met with President Wong, Provost Rosser, and other administrative members of the president’s cabinet with a list of ten demands to sustain and advance the College of Ethnic Studies. Mirroring the student movement led by Third World Liberation Front (TWLF) in 1968, hundreds of students rose to the occasion and displayed the spirit of the revolutionary and militant tradition of the TWLF to defend what they established almost five decades ago. At the end of the meeting, President Wong and his cabinet reluctantly agreed to meet with students by the February 29th deadline that students set to release a financial report and a plan of action to ensure that the College of Ethnic Studies is sustained and advanced. However, we must remain vigilant because we know very well that we cannot rely on the powers that be to genuinely uphold the interests of the students. In the spirit of 1968, we uphold the fight for the College of Ethnic Studies and call on all to join the struggle for our fundamental human right to a relevant and pro-people education and to combat the oppressive, neoliberal politics and policies that plague SFSU students, staff, and faculty today. DEFEND THE COLLEGE OF ETHNIC STUDIES! EDUCATION IS A HUMAN RIGHT! KNOW HISTORY, KNOW SELF! 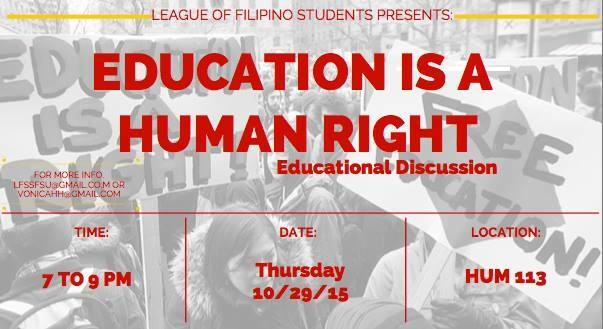 LFS-SFSU would like to invite you to the Education is a Human Rights Educational Discussion. We will be focusing on the State of Education at SFSU. Since more than 38.8 million students owe student loans and with more than $1.2 Trillion dollars in debt, as students, we need to fight capitalism in our educational system! Due to the huge student debt, it have discourage youth of color and students to pursue higher education. Education is a human right, and it is the government responsibility to educate its people not making profits from them. It is a government’s responsibility to educate its people. Please share this event with your respected family, friends, and organization(s)! We will also be conducting interviews of students from SFSU to show how students are struggling with the rising cost of education and student debt. Please let Vonica On or any LFS EC members if you are interested! The League of Filipino Students (LFS) condemns the selling of pouring rights to Coca-Cola and Pepsi at San Francisco State University. Coca-Cola and Pepsi are not welcome on campus due to their unsustainable practices, poor record of human rights and invasive expansion into third world countries,. The selling of pouring rights to either Coca-Cola or Pepsi is only the latest in the attempts to privatize and corporatize SFSU by President Leslie Wong. While President Wong claims that he is working for the best interests of the students, it is clear that he only has the best intentions for the profit of the university. Coca-Cola, in their presentation, claimed that it was striving “to make positive differences in the world in three areas: water, women, and well-being.” Coca-Cola also claimed to be an empowering force in the community, especially for women. They asserted that they also had the best interests of the university in mind, stating that they wanted to work with students and alleged that the campus’s history of activism will lead to great relations between the university and Coca-Cola. Similarly, Pepsi in their presentation to students claimed that their company was working towards sustainability and helping the community through campus influence. By claiming innovations in recycling and providing healthy products, Pepsi representatives spoke about providing healthy alternatives as well as improving environmental practices. “Diabetes is becoming a growing epidemic in low income minority communities,” spoke a Health Education professor at SFSU, “in my home country Brazil, it’s plain to see the damage that Pepsi Co has done in the neighborhoods and especially to indigenous people. LFS stood along with representatives of multiple student groups, workers’ groups, and faculty members in exposing the lies that the representatives of Coca-Cola and Pepsi were presenting. SFSU students and faculty spoke about the impact of Coca-Cola on a global scale, such as the destruction of water systems in India, deforestation in other countries, and rampant human rights violations in El Salvador and Colombia, including the forced disappearances of labor union leaders. Students and faculty demanded an audience with President Wong, calling for a public town hall meeting. Real Food Challenge, the main opponent of the selling of Pouring Rights, along with other student groups at SFSU were able to gather over 800 signatures from students prior to Coke and Pepsi’s arrival. The mobilization included the participation of students, professors, and workers unions coming together in order to fight against these large corporations. In the Philippines, Coca-Cola is guilty of harassing and endangering the lives of union leaders as well as offering unfair wages for workers in the Philippines. Coca-Cola refuses to acknowledge the collective bargaining agreements (CBAs) proposed by worker unions and instead made propositions that can lead to massive layoffs, outsourcing, and threatening of job security. Coca-Cola has played a pivotal role in the weakening of worker’s unions all over the world and being implicit in the use of death squads and other forms of violence to destroy union organizing. As youth and students of San Francisco State University, we must continue to the fight against the intensifying attempts at privatization on campus. We must unite our struggle with the struggles of the faculty and staff in order to truly fight against these corporations. We must struggle for genuine pro-people education and continue San Francisco State University’s rich history of youth and student resistance against corporations. For more information about pouring rights and how to fight against Coca-Cola and Pepsi, please follow our allies at Real Food Challenge on social media. Sign RFC’s petition against Pouring Rights here. STOP POURING RIGHTS AT SFSU! STOP THE PRIVATIZATION OF CORPORATIONS ON CAMPUS!